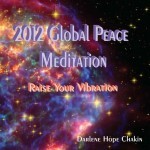 Announcing the new 2012 Global Peace Meditation CD, which will raise your vibration and effortlessly guide you into feelings of peace and calm. These journeys are designed to guide you to a deeper connection with yourself. Through that connection, you can raise your vibration and participate in increasing healing and peace in these transformative times leading up to 2012.